By CNN'S ALAA ELASSAR, BRIAN STELTER, OLIVER DARCY, AMANDA GOLDEN AND KEVIN BOHN CONTRIBUTED TO THIS REPORT. 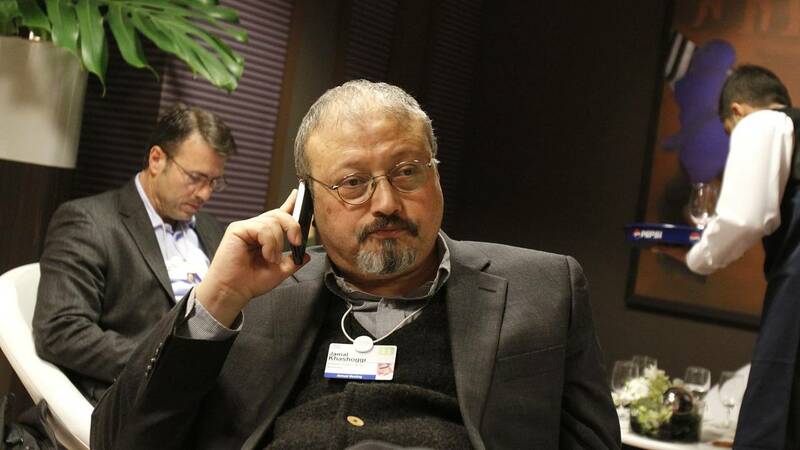 (CNN) - Friends of Jamal Khashoggi, the dissident Saudi journalist killed in disputed circumstances in his country's consulate in Istanbul, have demanded that authorities in Riyadh produce his remains. After nearly three weeks in which it denied anything untoward had happened at its diplomatic premises in Turkey, Saudi Arabia admitted Khashoggi had died but said it was the accidental result of a brawl. Speaking to reporters outside Saudi Arabia's Istanbul consulate on Saturday, Turan Kislakci, the head of the Turkish Arab Media Association and a friend of Khashoggi, called on Saudi Arabia to hand over the journalist's body. "Give us Jamal, so we can have a funeral for him. So that all people who care about him, world leaders, can come here to Istanbul for the funeral," said Kislakci. "Exactly 18 days ago, a brutal murder was carried out. Like Saad Hariri, we thought (Khashoggi) would walk out. Three days later we lost hope," he said, invoking the case of Lebanese Prime Minister Saad Hariri, who was detained in Saudi Arabia, according to multiple sources, last November. "We want justice for Jamal. Eighteen (suspects) are not enough. We want those who ordered it." Khashoggi's fiancée, Hatice Cengiz, reacted to the news of his death on Twitter late Saturday evening. She tweeted footage of Khashoggi speaking and being filmed when a cat unexpectedly jumps into his lap. He looks down and smiles. Khashoggi and the film crew laugh. "They took your bodily presence from my world," Cengiz wrote. "But your beautiful laugh will remain in my soul forever." Turkish officials have said privately that Khashoggi was dismembered, and Saudi authorities have failed to produce his body or say where they believe it to be. All they would say was that officials engaged in a cover-up. A source close to the Saudi Royal Palace told CNN that the location of Jamal Khashoggi's body is not known to the Saudis. The source said the body was handed over to a local "collaborator" after the killing, adding that it is not at the Saudi consulate in Istanbul. CNN cannot verify the assertion. US President Donald Trump indicated he believed the Saudi account was credible, although he added that some questions remained. On Saturday he told reporters he will speak soon to bin Salman about Khashoggi, possibly later Saturday. Asked about the whereabouts of Khashoggi's remains, Trump said, "Nobody seems to know. Somebody knows, but nobody of the various investigation groups at this moment know." He later added that "it's a concern" that the body has not been found. Trump added that his administration has not heard audio or seen video of the incident, denying reports that Secretary of State Mike Pompeo had reviewed the evidence that, privately, Turkish sources say exist. "He has not seen that, has not heard that, and I would tell you if he had. So far we've heard about it but nobody has seen it." Some members of the US Congress were less accepting of the Saudi version of events. "To say that I am skeptical of the new Saudi narrative about Mr. Khashoggi is an understatement," South Carolina Sen. Lindsey Graham, a Republican, said on Twitter. Senate Intelligence Committee ranking member Mark Warner told CNN the explanation "does not withstand scrutiny and raises more questions than it answers," and called for a "comprehensive and truly independent investigation." "The Trump administration's position once again demonstrates a lack of leadership, undercutting US leverage, interests and our values." A senior official in Turkey's ruling political party questioned the credibility of Saudi Arabia's explanation for Khashoggi's death. Justice and Development Party spokesperson Omer Celik indicated that Turkey was not satisfied with the Saudi contention that Khashoggi died accidentally rather than as the result of a premeditated killing. "We are not pre-emptively blaming anyone but we will also not allow a cover-up," Celik said on Saturday, in the first official Turkish reaction to Saudi Arabia's midnight statement saying Khashoggi's death was accidental. "It is a matter of honor for us that this is uncovered. We will shed light on this using all means we have. That is the will of our President," Celik said. In a statement released in the early hours of Saturday morning, Saudi Arabia said Khashoggi died in a fistfight after a discussion turned violent. A source with close connections to the Saudi Royal Palace told CNN that, in the Saudis' determination, Khashoggi's cause of death was a chokehold or strangulation, but officials provided no evidence to support the conclusion. The altercation involved multiple Saudi officials at the country's consulate in Istanbul, according to the statement. Turkish officials say 15 Saudis traveled to Istanbul on the day of Khashoggi's disappearance, and they say privately that he was dismembered at the consulate. The suspects later tried to cover up the incident, the Saudi statement added. Authorities announced a purge of top Saudi officials, the detention of 18 people and an overhaul of the intelligence services that will be led by the country's de facto ruler, Crown Prince Mohammed bin Salman -- whom US officials privately believe must have been aware of the operation to target Khashoggi. Riyadh's statement was the first official confirmation that Khashoggi died at its Istanbul consulate, and the first admission that it had a role in his killing -- even as it suggests the death was accidental. Khashoggi's death occurred on Saudi sovereign territory and should fall under its jurisdiction, Justice Minister Walid Bin Mohammad Al-Samaani said Saturday. "The case will reach the Saudi judiciary after fulfilling all requirements," he added. While Saudi Arabia's regional allies praised the Kingdom's "transparency" after it released the results of the preliminary investigation, voices around the international community condemned the attack and belated report. UN Secretary-General Antonio Guterres was "deeply troubled" by the explanation, his spokesman said. German Chancellor Angela Merkel rejected the Saudi statement, saying that her government expected "transparency in terms of death and background. Those responsible must be held accountable. The information given at the consulates in Istanbul is insufficient." The European Union, in a statement from its high representative for foreign affairs and security policy, Federica Mogherini, said it insists on "the need for continued thorough, credible and transparent investigation, shedding proper clarity on the circumstances of the killing and ensuring full accountability of all those responsible for it." The publisher and chief executive of The Washington Post, for whom Khashoggi was a contributing columnist, cast doubt on Saudi Arabia's explanation. "The government of Saudi Arabia has shamefully and repeatedly offered one lie after another in the nearly three weeks since Jamal Khashoggi disappeared in their Istanbul consulate," Fred Ryan said in a statement published on Twitter. "Offering no proof, and contrary to all available evidence, they now expect the world to believe that Jamal died in a fight following a discussion. This is not an explanation; it is a coverup," Ryan said.